When I was twelve, my Great Grandma Alma took me to the fabric store to buy fabric and pattern of my choice so she could teach me how to sew my own clothes. I spent a few weeks from my summer vacations as a teenager at her dining table, cutting fabric, sewing and having her expert help at every step along the way. At almost 30, I still have moments when I wish Grandma was here to show me how to do things, especially with tricky closures like buttons and zippers. Now I have the help of Craftsy with a FREE ONLINE CLASS, "Mastering Zipper Techniques"
For vintage enthusiasts, it's essential to know how to install a zipper. So many of my favorite vintage dress zippers have been found with missing teeth, rusted or broken zippers or no zipper at all. 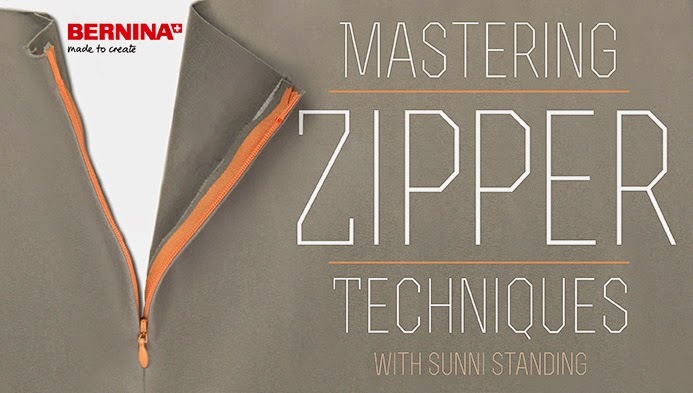 Mastering Zipper Techniques is a great class for beginners, taught by Sunni Standing, blogger of A Fashionable Stitch. This interactive online class includes five video lessons for you to watch as many times as you like and learn at your own pace. Once you enroll in an online Craftsy class, you can log back in to Craftsy and watch it as many times as you like. It’s yours forever! I like to set my laptop up in the kitchen to watch while I make lunch for the kids, then watch and learn again as I sew along after lunch. Mastering Zipper Techniques also provides downloadable step by step instructions for every zipper technique in the class so you can print it out and keep on hand in your sewing box. If you have questions, you can post them in the forum on the sidebar of the class and get helpful tips and advice from fellow Craftsy members. Paid classes offer the support of the instructor as well as your classmates. One thing that I really love about online Craftsy classes is the 30 second repeat feature. I taught myself to knit and crochet using video lessons. On countless occasions, I had to slide the video player back and re watch to figure out how to do it. Craftsy's 30 second repeat feature replays the last 30 seconds of a video with one click of a button so you can keep watching that section of the video till you nail it. Slot Seam Zipper- A very basic zipper is the slot seam, in which two edges of a seam meet in the center, covering the zipper. Sunni makes it look so easy and with the right tools at your side, it really is! Invisible Zipper- an invisible zipper is used in fine garments for a professional finish. The invisible zipper and stitching is completely hidden except for a small zipper pull. This is the perfect zipper for a dress or delicate blouse. Lapped Zipper- If you're sewing a fab pair of 1940s trousers or sleek 50s pants this fall, you may need a lapped zipper in the side seam. A lapped zipper is a common feature in quality vintage dresses as well. In addition to covering how to install these specific types of zippers, Sunni also talks about some basics of sewing including how different types of zipper feet work for your machine and brilliant short cuts like using fusible tape to hold your zippers in place before sewing. Whether you're new to sewing or an experienced seamstress, enroll in Mastering Zipper Techniques for FREE and learn how easy it is to install a smooth, well-placed zipper in your garments.